If you take a peep at the ways of learning in an educational or organizational setup, you might find it to be slightly flawed or not as advanced as you would want it to be. Recently, there have been extensive discussions on whether the current model of learning & development should be reformed or not. And, a majority of individuals keep an opinion in favor of this change. Nowadays, it is a commonly shared point of view that students should be given multiple options to choose from when it comes to acquiring knowledge. Furthermore, as far as learning is concerned, every person has his or her pace and style to receive it. Be it in an educational institution or an organization, people wish to have their own customized learning experiences. And, the type of credentials that can bring such a revolution in the realm of learning is referred to as digital badges that are gaining an immense amount of fame these days. The trend of digital badges got viral in the year 2011 and since then it has revamped the learning journey of many students as well as executive seeking professional development. 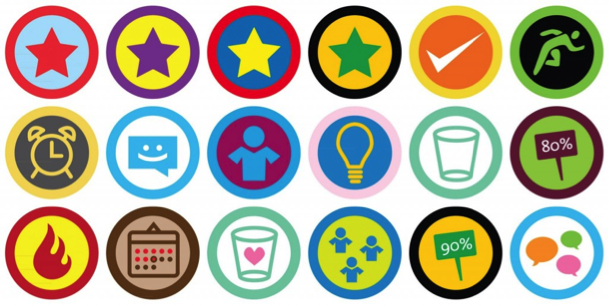 Digital badges function as indicators of a learner’s skills and accomplishments. They visually represent one’s competencies and are supported by evidence and verifiable data. With changing times, the educational society has become more welcoming to new ideas, especially, if they lead to better learning experiences for students. The unique selling point of digital badges is that they bestow a higher level of flexibility in creating learning experiences that are deeply personalized. In case, one decides to earn a badge, he or she will have the freedom to learn in a wide range of environments in order to demonstrate proficiency. Hence, the development of knowledge and skills and the acknowledgment of efforts do not have to take place primarily in a classroom environment. Digital badges endorse the fact that learning can happen at any location and at any age, moreover, the traditional techniques of assessment do not succeed in all kinds of learning. The space of credentials has expanded to a considerable level and built a long line of people, especially educators, who are intrigued to pursue them. Besides, one of the chief reasons for micro-credentials to be a huge hit is that the learners can avail the opportunity to pursue their choice of credential and design their personal education playlist. These days, educators are inclined towards micro-credentials as they give them a chance to be the controller of their own career development by leveraging a platform where they can exhibit their subject knowledge and earn a credential in return. That being so, educators who themselves embrace the innovative transformation in the process of learning are beginning to construct and preach these new and improved learning experiences for their pupils who can finally move out of their school buildings and get a key to the gateway to a whole new world that has even more interesting things to teach them. How One Could Managing Work With Business Phone System !